What comes to mind when you hear “Marsala”? Do you think of chicken? Perhaps if you’re a movie buff like me you may think of Ben Hur…no, wait…that was Messala, close enough but Ben’s adversary was neither a tasty poultry dish, nor was he the hot topic on the catwalks, no matter how spiffy he looked in his toga. Nope, I’m not talking about chickens or generals today. You may already have some Marsala in your life and not even realize it. It could be in your shoes, your shirt, your bedroom, kitchen, or studio. While I was gathering clips and info for this article I think I even saw it in a truck commercial. Marsala is everywhere—but what is it? Ever wonder where our colors come from and how everyone keeps track of them? How can one printer or manufacturer in Milan get the same exact color for a product as one in Los Angeles? The design industry has a standard they go by and it’s a company called Pantone. Pantone started back in the 1950s and the idea behind it was to help designers everywhere color match their creations regardless of what equipment or methods were used to produce any given color. Every color you see, whether it’s on a billboard or your own website has a matching Pantone color. Colors vary greatly from one medium to the next. A color printed on glossy paper won’t look the same on a paper with a matte finish, or no finish at all. They’ll also vary from monitor to monitor. With a Pantone color code, you’re assured that’s your color no matter where it shows up. So, what does this have to do with Marsala? 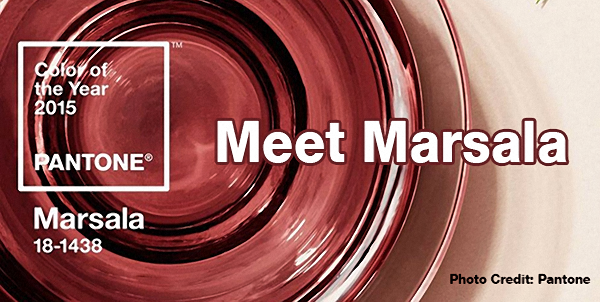 Every year Pantone announces it’s Color of the Year, and this year, it’s Marsala. As I mentioned before, you may already have some Marsala going on in your life. Fashion and interior designers keep a close eye on color’s cutting edge, always looking for the next great trend. The same goes for your website. Not only do web designers watch the tech side, we watch what colors are hot and which ones are not. Color can make your site look just as dated as any of the other elements on it. Wondering why your Cerulean* is lacking oomph and can’t quite put your finger on why? Could be because Cerulean was the Color of the Year in 2000 and it’s just not vogue anymore. Trends change on a dime in the design industry, and even faster on the web. Last year’s Radiant Orchid is so passé now and orange is no longer the new black. Pantone’s Color of the Year is a starting point. You don’t have to use it, especially if earthy tones don’t fit your brand. But if they do, taking a look at some of the other color pairings that go with Marsala will help define the color pallet for your new site. Looking at those pairings makes it easier to decide which color you want for the primary color of your site and which ones to use as accents. Really, something as simple as changing the color pallet gives your site a fresh new look without changing a whole lot. It’s like putting a new coat of paint on a room. Oh, yeah…but then you realize the carpet, curtains and furniture all need to change too. But that’s okay, that’s where we come in. We’ll help you decide what you really need and what has to go. You’ll be surprised at how little it takes to update your look. In fact, contact us today for a free consultation. We’ll take a look at your site and help you figure out exactly what it is that needs changing. We have an affordable new option available for people just like you who want a simple facelift for their site without going through the painful and expensive process of a complete overhaul from the ground up. *Check out this link for a classic clip from “The Devil Wears Prada”. Anne Hathaway gets schooled by Meryl Streep on exactly how that color blue ended up in her closet. I have always been intrigued by Pantones and the color of the year. I do love this Marsala. It almost has a chocolate feel to it, and in my opinion, it’s WAY better than last year’s Radiant Orchid. That looks like a very flat lavender to me. Oh well, to each his own of course. Color can be very personal. Thanks for this post. Now, I know that Marsala can be related to something besides chicken, and I never knew that before today! I agree, wasn’t a big fan of the Orchid. This color is interesting because it goes back and forth between the red and the brown, there’s something warm and inviting about it. And yes, I’m still laughing about the chicken. I LOVE the Pantone color system! So many times has that saved my bacon when I’m creating something! And I really do love this color! My new branding is all in earth tones so I’ll have to see how this might fit in. Thanks! Same here, Kim. I love it when clients send me the Pantone colors they want to use or are already using. Can’t wait to see how you use the color, keep us posted! I love the clip you included! It was amusing, yes, but it also spoke directly to me! I haven’t seen the whole movie, but I’d say I would identify with Anne Hathaway’s character. But Meryl’s character makes it sparkling clear that there is no way to NOT participate in color and fashion. I’d be interested to know how Pantone decides each year. Fascinating! It’s a great movie, Angela, definitely watch the whole thing. I wanted to know too and in their video they really didn’t say how they chose it. I would imagine though there’s a whole science behind it.